A multiple choice question is a question type where the respondent is asked to choose one or more items from a limited list of choices. A multiple choice question consists of a stem, the correct answer, and distractors. The stem is the beginning part of the item that presents the item as a problem to be solved, a question, or an incomplete statement to be completed. The options are the possible answers you can choose from, with the correct answer called the key and the incorrect answers called distractors. This complete guide on how to create efficient multiple choice questions is a great resource if you want to use MC questions in your next survey. There has been much debate whether multiple choice questions are useful. We've listed their biggest advantages and disadvantages. 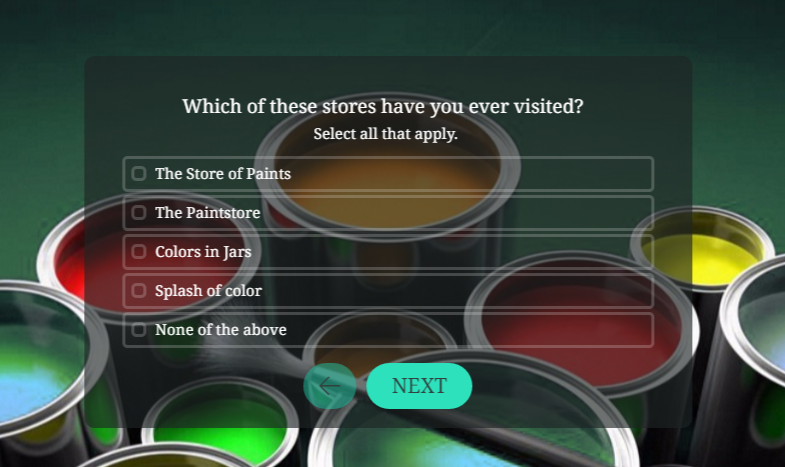 Create a survey with multiple choice questions or 15 other question types. Within Survey Anyplace you can ask for two kinds of multiple choice questions: Text choice and image choice.